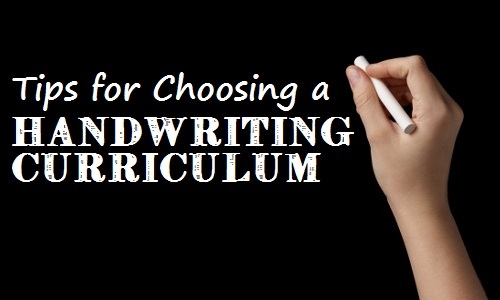 Looking for a handwriting curriculum? Whether you are new to home schooling, or have been a pro, choosing the right homeschool handwriting curriculum can be a daunting task. When considering handwriting materials for your younger child, there are several good products. Trying them to find the style your child works best with will assure that your child achieves success. Each child has a different style of learning, and the textbook companies have produced products that will appeal to different learners. Whether your child writes naturally and loves to form letters, or getting them to write is equated to getting a shot, there is a program that will work for you and your child / children. Things to consider when choosing the right material is whether your child is a pleaser or merely wants to finish the task. Does your child lose interest when doing repeated tasks and need a purpose to their writing, or would your child benefit more from worksheet type work. How easy will your program be to stick with, and should you ever switch your child to another learning environment will they be able to adapt? These are all questions you should ask yourself as you search through writing materials. If a child needs a lot of engagement then handwriting courses that put a lot of emphasis on storytelling may be a good option. Some parents are successful in teaching handwriting completely by themselves by coming up with ways to make it fun for each child. Children that already have a love for books and the written word often have a keen interest in learning how to write so they can make up stories of their own. Artistic children may enjoy the fact that handwriting can add more emphasis to the message they are trying to convey with their art work or any other artistic endeavor. Children are quick to realize the message of the written word and how it is necessary for communication. Children that develop strong language skills are better at negotiating and conveying information when they enter the job market. Great language skills can have a big impact on the earning power and success of a child. Some public schools and private have decided that since many people use computers to type communications or just use print letters, that there is little use in teaching students to write in cursive letters. This has been a controversial issue with some parents. Homeschooling allows you to still teach this skill. Many parents believe that there is some value in teaching cursive still because children should at least be able to read it when others use it. Not teaching this valuable skill can put a child at a disadvantage in some cases. Handwriting Without Tears is a good program, with successful use by teachers and parents across the country. HWT incorporates fun entertainment to students while using proven instructions methods. 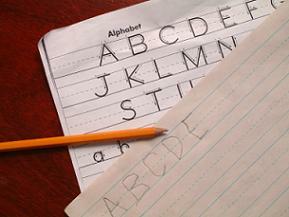 HWT teaches students print to cursive, in the easiest style to learn. The workbook design is simple and predictable for all students, and uses double lines. This option is very versatile if teaching multiple children, since the strategies employed by the publisher are appealing to all students at some level. Click here for more information about this method. 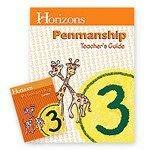 Horizons Penmanship is another popular choice among home schooling parents. This homeschool program will have your child practice forming letters, concentrate on spacing, capitalization, punctuation, and pencil grip. It moves from print to cursive in 2nd grade. When using this approach, the teacher is also teaching other material simultaneously, since students are copying Bible verses and historical documents to enhance learning. This method is good for students who need more to engage them than simple hand writing tasks. If you have a reluctant writer, or an artistic child, make writing child’s play. Draw Then Write is a book that incorporates fun and learning. Children draw a picture, then practice writing by making up a story to go with the drawings. This may not be able to completely replace another writing program, but it is a wonderful supplement. It also teaches children that the written work is “publishable” and gives them a boost in confidence. These books are available in e-book format or print so they are easy to get and reproducible for multiple homeschooling families. Since the sheets can be printed indefinitely you can give a child many chances to come up with different story lines and characters. Some children may even want to use these sheets when they have playtime because they are that much fun! Much like the publishing feature found in Draw Then Write, A Reason for Handwriting also provides publishable materials. The philosophy is that if children realize their work may become public will inspire them to make it neater. This teaches a student to have a certain pride in their work and confidence when it comes to public presentations. Fancy border sheets suitable for display are provided for students, as they work their way through the material. In addition, this program incorporates daily Scripture lessons by having the students focus on verses from the Living Bible, paraphrased, so in a way, the Christian homeschooling family gets two courses in one with this system. Fans of the Charlotte Mason method will like Copy Work which places emphasis on building skills by first teaching basic letters followed by the sharpening of skills by copying passages or stories. This method can be used well in both secular and Christian homeschools. Bible quotes can be used as a way to teach writing as well as passages from famous literature. Many parents mix up the work a lot to keep their child’s attention. The Joy of Handwriting by Joy Bryant is a very affordable curriculum with reproducible worksheets which mean you can save even more if you save materials for other children. If you are part of a homeschool group then the cost is even less. The Joy of Handwriting includes flashcards and innovative story pages. The story pages just have a picture on them and a blank space where children write down a story to go along with the picture. This encourages independent thinking skills and creative thought processes that can take a child far in life. If you like the idea of a handwriting program that is directly tailored to your specific faith, there are quite a few options. Here are a few that are popular and common. Those of other faiths should be able to find something available with an online search. Landmark’s Freedom Baptist Curriculum offers a penmanship course. The book is black and white so it may seem dull to younger kids that have a hard time concentrating. That doesn’t mean you cannot add to it though to keep it interesting for kids. Some parents use the course for several years since it takes awhile to work through. Tests and quizzes are included and students learn a lot of Bible verses. For more info…. Handwriting is the basis for achieving success in all other subjects. Your child will need to be able to provide proven results with neat penmanship throughout life and finding the materials that will help your child achieve success are important. Home schooling parents are at an advantage by being able to oversee their child’s success through the selection of appropriate materials. Being able to use hand writing while teaching values is another great advantage for parents that home school. Don’t feel pressured or that there is only one answer for your needs. Try different products, talk with other home schooling parents, go to vendors, and look through the different materials. Once you have found the product that will work with your family, search for the best deals online to make your purchases. Parents that have designed their own handwriting curriculum often share this information readily. There are many worksheets and online resources that are free so if you are on a budget there is still no reason why you cannot have a quality handwriting curriculum. This also gives you the power to implement other subjects that they are learning about at the time.